So now we’re in Virginia Beach. This is the other side of Virginia from Front Royal, but it also means that we’re seeing a very different sort of Virginia. This is, as you might guess from the name, on the ocean, facing a 10-mile (or 15-mile or 20-mile) beach, with Atlantic breakers crashing onto it. 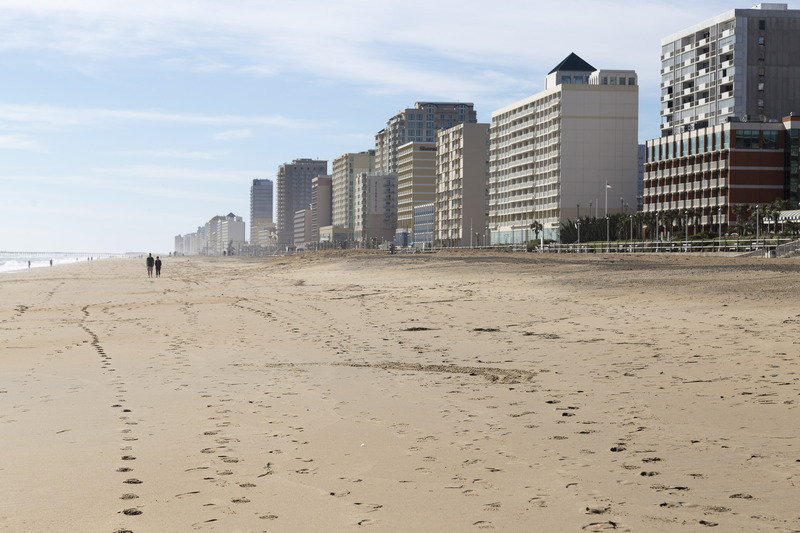 Behind the beach is a 2.5 mile boardwalk; and behind the boardwalk are 2.5 miles of high-rise hotels. We drove here yesterday. It’s about 250 miles or so, and it took us most of the day. We left Front Royal at just before 10 and we got here at about 3:30. ‘Here’ is a big Holiday Inn on six floors with two wings,so it’s all a bit different from the two cosy B&Bs where we spent the previous six nights. Partly the aim of coming here was to do something completely different, and partly it was to have a day or so where we didn’t have anything to do, when we could just relax. And that’s what we seem to be doing. We went out for a pizza yesterday evening, which Val described as “possibly the best pizza I’ve ever had”. A 14″ thin-crust base, lots of mozzarella and tomatoes, and lots of pepperoni, Val’s favourite topping. Mine was certainly good as well – a veggie version on the same base. Today we’re chillin’. We walked north along the beach for mile or a bit more, and paddled at the edge of the water. We had coffee at the northern-most hotel (a Wyndham, and well beyond the boardwalk) where we heard that last weekend’s storm (caused by Hurricane Matthew) brought the ocean over the beach and onto the hotel’s outdoor patio. And in some cases the ocean got into the hotel. Either the ocean or the day-long driving horizontal rain…. But the storm has passsed through and right now we’re sat on a bench on the boardwalk, reading and relaxing. Well,Val is – I seem to have been writing blog posts for the past hour or so…. Update: after doing more relaxing we went for a drink later at the interestingly-named (to UK eyes) ‘Lager Heads‘ bar and restaurant. We both enjoyed a glass (each) of craft beer – I had a bitter and Val had a Pilsner. A look at the menus suggested that the food looked good so we went back there for our evening meal.